STE.-ANNE-DE-BEAUPRE, Quebec (CNS) — Cardinal Marc Ouellet called upon Canadians to be mindful of the needs of migrants and refugees during a Mass celebrating the feast of St. Anne. “Let us carry in prayer these migrants and refugees to whom we do not remain indifferent despite the temptation to ignore or repress them so as not to be disturbed in our peace or comfort,” he said. The cardinal also mentioned the pope’s trip to Bangladesh in December 2017, where he met with members of the Rohingya refugees form neighboring Myanmar, and his concerns about migrants trying to enter the United States at the Mexican border. 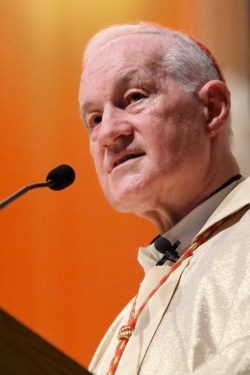 “The Holy Father continues to draw attention to these populations drifting from one continent to another, and from one country to another, who are exposed to all sorts of dangers and abuses,” Cardinal Ouellet said. He presented Jesus as the answer to today’s challenges. The Mass also marked the 50th anniversary of Cardinal Ouellet’s ordination to the priesthood. Cardinal Gerald Lacroix of Quebec invited Cardinal Ouellet to the basilica for the celebration. The visit was the first by Cardinal Ouellet at an event in the Archdiocese of Quebec since Cardinal Lacroix’s March 2011 appointment. In his homily, Cardinal Ouellet said he was “particularly happy” to be in Ste.-Anne-de-Beaupre, noting that he had celebrated a farewell Mass in the basilica in 2010, before accepting the call of Pope Benedict XVI to work at the Vatican.